Environmentalists held a small demonstration in the car park on the proposed new Aldi store in a bid to save nine mature trees. The German chain plans to remove the features to make way for its brand new 1,254 sqm supermarket and 128 space car park on the current Co-op site in Park Street, Deal. In a stand against this, members of Deal and Dover Green Party held a “love-in” where they tied messages to the trees and handed out leaflets to shoppers. Green Party parliamentary candidate for the area, Beccy Sawbridge, said: “It’s not about not wanting the supermarket there but making sure these trees aren’t unnecessarily taken away. “Trees do so much for us to protect our increasingly fragile eco system. 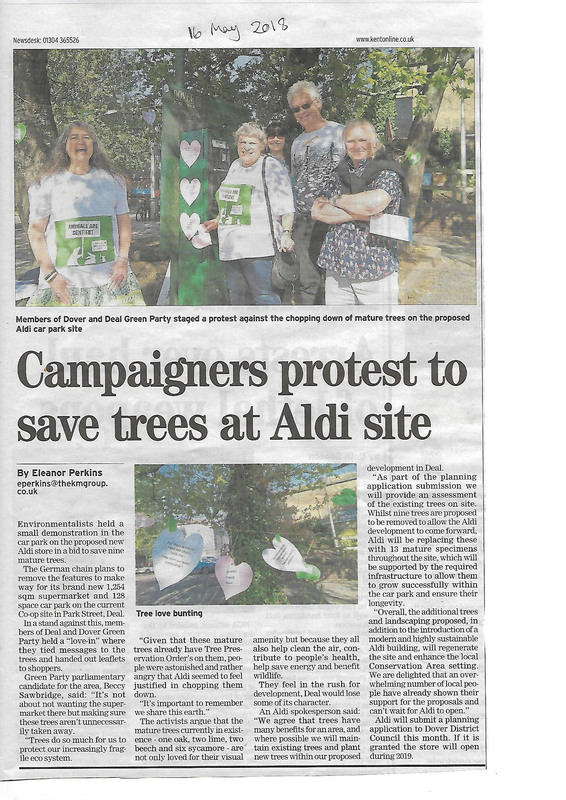 “Given that these mature trees already have Tree Preservation Order’s on them, people were astonished and rather angry that Aldi seemed to feel justified in chopping them down. The activists argue that the mature trees currently in existence – one oak, two lime, two beech and six sycamore – are not only loved for their visual amenity but because they all also help clean the air, contribute to people’s health, help save energy and benefit wildlife. They feel in the rush for development, Deal would lose some of its character. An Aldi spokesperson said: “We agree that trees have many benefits for an area, and where possible we will maintain existing trees and plant new trees within our proposed development in Deal. “As part of the planning application submission we will provide an assessment of the existing trees on site. Whilst nine trees are proposed to be removed to allow the Aldi development to come forward, Aldi will be replacing these with 13 mature specimens throughout the site, w’hich will be supported by the required infrastructure to allow them to grow successfully within the car park and ensure their longevity. Aldi will submit a planning application to Dover District Council this month. If it is granted the store will open during 2019. This entry was posted in Air quality, Environment, News on May 30, 2018 by Sarah. In November 2017, our Dover and Deal Green Party campaigners put up air quality monitors outside four primary schools in Deal and five primary schools in Dover. Then they took the nitrogen dioxide results to the professionals at Dover District Council (DDC). “We are very aware that deaths attributable to air pollution in the UK, at 8% of the annual death rate, are higher than in neighbouring countries, it is an issue that we need to work on together.” Commented campaigner Liz Hayes. and outside the old Town Hall. Both areas continue to show levels that breach legal limits. The DDC team are preparing to consult and draw up a new action plan to improve air quality in Dover in early 2018. Details will soon be available on how local groups such as local Green Party campaigners can participate in the consultation. the introduction of no-idling zones. In Dover the number of freight vehicles who keep their engines running while stationary, in cold or hot weather adds significantly to air pollution in the town. Also, the lack of good public transport and zero emissions transport options on new out-of-town developments are making pollution levels worse. by replacing their commercial fleet with electric vehicles. Many private car owners are aware that children’s lungs are particularly vulnerable and switch the ignition off to protect young lungs. Many of our supporters are parents of young families and have said they would buy plug-in electric cars if only there were some electric charging points in the District. Another form of protection for schools with playgrounds on busy roads is to plant street trees as a living barrier. We’d be very happy to work with community groups and across party lines to lobby for some solid improvements on this issue; prevention is better than cure!”. This entry was posted in Air quality on January 28, 2018 by Sarah. Four sites in Dover scored 8 out of 10 for bad air quality in a BBC pollution warning last July. To help improve the situation, can you help us raise £200 to pay for 10 NO2 air monitors for Dover and Deal, and some particulate matter ones? We spoke to Dover District Council back in March 2017, to discuss ways to reduce car use and encourage a switch to low emission vehicles. Dover district has no working electric charging points for cars – Maidstone has 14. Canterbury Green Party with Canterbury Clean Air have taken effective action recently and we’d like to take a leaf out of their book! Please help us if you can – thank you! This graphic was part of a BBC pollution warning in July 2017. It shows 4 sites in Dover with 8 of 10 for bad air quality.